As pet parents ourselves, we understand that hiring a pet sitter might make you nervous. Asking someone to come over and care for your pet while you’re away can seem scary at first, but it makes your life much easier knowing that an expert pet sitter can be there to provide needed attention and support for your pets when you can’t be there. 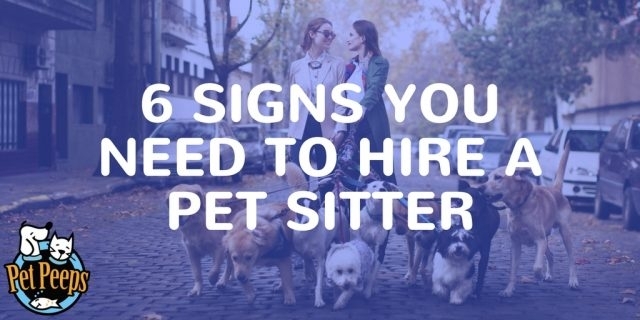 Take a look at some signs that you need to hire a pet sitter. Some might even sound familiar! As you walk up to your door, you think about what piece of furniture your pet has clawed or chewed up, and how much cleaning you’ll need to. This means they’re bored and need attention! When you see your neighbor, they do their best to politely ask if your dog is alright, because it sounds like something is wrong whenever you’re away at work. This is their subtle way of saying your dog has been barking all day and is quite bored. Once you’re done making dinner, cleaning up, and making sure everything is in order, your canine companion is still wagging his or her tail by the door, waiting for you to take them on a walk. Problem is, you’re just about ready to collapse into bed. Whenever it’s time to go to the vet, the doctor reminds you to stay on top of your pet’s health because they need to lose weight. When you’re at work and can’t go for an afternoon walk with your dog, our professional Pet Peeps will be happy to come by and help them with their needed exercise. This is twice as difficult if you have two or more dogs and can’t handle taking them for a walk all at once. Individual walks are even more challenging! Work responsibilities require you to stay later than usual, but it’s difficult to concentrate on work when your thoughts are all on your pets: if they’re hungry, safe, making a mess, or feeling neglected in general. These are just some of the many reasons why hiring a pet sitter can greatly benefit busy pet parents. This way, they get all the love and attention they need when you need to attend to other responsibilities, and you don’t have to worry endlessly while you’re away. Win-win for all!